How to Clear Cache on Android Phones? Home > Resources > Clean up > How to Clear Cache on Android Phones? Now, open your Android phone and you won't be surprised to find there are some cache folders are saved on your phone. Feel strange since you never manually save these files? Actually, these files generally come with the useful files. For example,when you are downloading certain files like photo, app and etc. from the internet, such corresponding cache files will be generated and stored on your device. And do not expect these files to perish on their own! To clear cache on Android phones, this Android Data Cleaner can't be missed! With this software, you can easily clean up these useless cache files on Android phones. 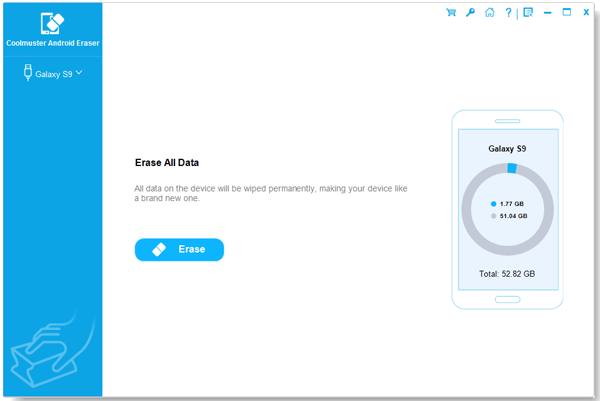 Aside from caches, you can also clean up other junk files from your phone within simple clicks, like download temp files, app crash logs, user storage files and many more. Best of all, all the Android phones and tablets can be perfectly supported! So just get this software to clear cache on Android and speed your slow device to the best! First of all, open the installed software on the computer and then get your Android phone connected to the computer. It will then detect your device and scan for all the files saved on your Android phone. Then all the file folders will be displayed on the left panel. You can enter the different tabs to preview more detailed information. Then click on the Erase Now option to erase the wanted files from Android in one click. With this Android Data Cleaner software, cleaning up cache files from Android phones is just a piece of cake! So what are you waiting for? Just get it to clear cache on Android phones within simple clicks!